Description: ELDO Action. Here is an original photo that I took of Pennsylvania Railroad trackage in the Eldorado section of Altoona, Pennsylvania, during January of 1966. Shown here is the railroad crossing at 58th Street in Eldorado. Visible in the distance are a switch, a shanty, another position-light signal, as well as a PRR train waiting for permission to proceed. These are the tracks connecting Altoona (to the front) and Hollidaysburg (to the rear). From 1850 to 1854, while the Horseshoe Curve was under construction, this was actually part of the PRR's main line between Philadelphia and Pittsburgh. Description: ELDO Action. 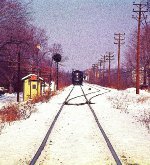 Here is a telephoto view that I took of Pennsylvania Railroad trackage in the Eldorado section of Altoona, Pennsylvania, during January of 1966. Shown here is a telephoto view of the shanty with the "ELDO" sign on it which sits where a Tower of the same name once stood. Note the treehouse on the left ~ way up there! Description: ELDO Action. Here is an original photo that I took of a Pennsylvania Railroad train in the Eldorado section of Altoona, Pennsylvania, during January of 1966. Shown here (L to R) are PRR engines #9819 and #9537. Both locomotives were built by EMD and are rated at 1,500 horsepower each. #9819 is an EF-15A built in 1951, while #9537 is an EF-15 built in 1948. Their crew is waiting for permission to move their mixed-cargo freight train from Altoona through Eldorado to the Wye Switches and points West. Description: ELDO Action. Here is an original photo that I took of a Pennsylvania Railroad locomotive in the Eldorado section of Altoona, Pennsylvania, during January of 1966. Shown here is PRR engine #9819, an EF-15A built by EMD in 1951 and rated at 1,500 horsepower. Its crew is waiting for permission to move their mixed-cargo freight train from Altoona through Eldorado to the Wye Switches and points West. Description: ELDO Action. Here is an original photo that I took of a Pennsylvania Railroad train in the Eldorado section of Altoona, Pennsylvania, during January of 1966. Shown here (R to L) are PRR engines #9819 and #9537. Both locomotives were built by EMD and are rated at 1,500 horsepower each. #9819 is an EF-15A built in 1951, while #9537 is an EF-15 built in 1948. Their crew is waiting for permission to move their mixed-cargo freight train from Altoona through Eldorado to the Wye Switches and points West. Description: ELDO Action. 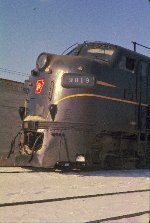 Here is an original photo that I took of Pennsylvania Railroad trains in the Eldorado section of Altoona, Pennsylvania, during January of 1966. Shown here are two PRR trains: the one on the left is sitting still, but the one on the right is moving. On the left (R to L) are PRR engines #9819 and #9537. Both locomotives were built by EMD and are rated at 1,500 horsepower. #9819 is an EF-15A built in 1951, while #9537 is an EF-15 built in 1948. On the right is PRR engine #9392, an ES-12 switcher built by EMD in 1950 and rated at 1,200 horsepower. It is pulling a local train from Altoona through Eldorado to the Hollidaysburg Yards. It is actually by-passing the line-haul train that is still waiting for permission to proceed. Description: ELDO Action. Here is an original photo that I took of a Pennsylvania Railroad train in the Eldorado section of Altoona, Pennsylvania, during January of 1966. Shown here (L to R) are PRR engines #9819 and #9537. Both locomotives were built by EMD and are rated at 1,500 horsepower each. #9819 is an EF-15A built in 1951, while #9537 is an EF-15 built in 1948. Their crew has received permission to proceed, and so they are moving their train across 58th Street on their way to the Wye Switches and points West. Description: ELDO Action. Here is a telephoto view that I took of a Pennsylvania Railroad train south of Altoona, Pennsylvania, during January of 1966. Shown here (R to L) are PRR engines #9819 and #9537. Both locomotives were built by EMD and are rated at 1,500 horsepower each. #9819 is an EF-15A built in 1951, while #9537 is an EF-15 built in 1948. The train is passing over the two-lane Sixth Avenue Extension near Canaan Station on its way to the Wye Switches, the New Portage Branch Line, the Gallitzin Tunnels, and points West. The Diesels, the truck, and the car were all built by GMC!